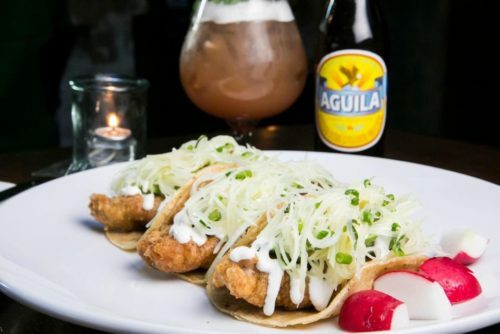 Coastal Kitchen was named one of the top 30 must-visit restaurants for tacos on Long Island by Newsday. The publication loved our tacos, made with pan roasted flounder and grapefruit habanero salsa. While our fish tacos are a crowd favorite, they’re not the only meal option we have. If you’re a fan of fish, there are several options on our appetizers and small plates menu that are sure to satisfy your hunger. Order our poke bowl, made with ahi tuna, lollipop kale, orange ponzu, avocado, farro, crispy shallots, sesame, chopped pineapple, and spicy aioli for a flavorful kick. We also have shrimp pincho, which is a Caribbean kebob with four seared shrimp, lime, and Dominican wasakaka sauce. Our firecracker clams are a gluten-free option that is packed with flavor. This menu selection is made from little neck clams, roasted chile butter, fresh lime, and smoked bacon. Maybe you’re not in the mood for seafood, and that’s OK! Coastal Kitchen has more Mexican inspired dishes, other than our tacos, for you to enjoy. Order the nachos made with shredded chicken, Monterey jack cheese, salsa verde and roja, chipotle queso, black beans, onions, cilantro, and sour cream. At Coastal Kitchen, we’re all about flavor. We’re excited to be recognized by Newsday as having some of the best tacos on Long Island, and hope you will visit our restaurant soon! Come try our fish tacos by visiting 12 E Main Street in Bay Shore, or call us at 631-665-3030 for more information.